The Great Beauty is a visual attack on the senses, a display of Rome in its various modern guises; Tranquil city of art, beauty and architecture by day; Hedonistic playground for the rich and famous by night. 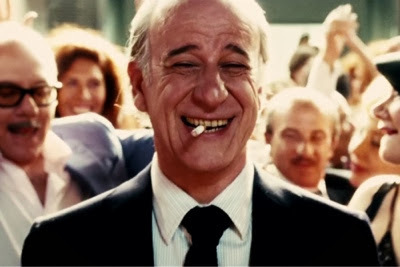 It is in the latter of these landscapes, a rooftop birthday party that's more reminiscent of an Ibiza rave, that we meet Jeb Gambardella (Toni Servillo), a writer and social vampire who spends his nights drinking with Rome's elite and his days catching up on sleep. The film follows Jeb on a journey of soul-searching after learning of a former lover's death, contemplating the merits of his semi-chaotic lifestyle, along the way exploring the nooks of Rome and the many eccentrics and grotesques that inhabit the city. It's a very beautiful film, full of colour and movement. The camera rarely stays still, gliding across the screen in vast, sweeping panning shots and it gives the film a fluid style, reflecting how Jeb is always on the move (his apartment is the only location that we pay repeated visits) in his search for life's 'great beauty'. It's also a film full of melancholy. Every character seems to be flawed, using wealth to mask a deep fragility, desperate to keep up appearances. As Jeb passes his 65th birthday, the death of his childhood sweetheart brings his own mortality home to roost and the film is more of a study to the true meaning of life, underneath all the trivialities of everyday living, examining the things that matter most - love, beauty and family. The Great Beauty one of the most difficult films I've reviewed so far. There's no real story here, just a study of events surrounding one man during a period in his life. The 150 minute-long running time can be very testing too but ultimately I enjoyed this film. It's a piece of art rather than a form of entertainment and I found it quite inspiring, albeit in a very sombre kind of way. It's interesting and certainly worth a watch if you like art films. Wes Anderson is one of those Marmite directors. I love the style of his films and he's definitely one of the most original filmmakers of my generation, but despite wanting to love every film he's made, I just can't seem to do it. I want to, but I just can't. I'm a big fan of Bottle Rocket, Rushmore and The Life Aquatic with Steve Zissou. Fantastic Mr Fox is one of my favourite films, however, The Royal Tenenbaums, The Darjeeling Limited and Moonrise Kingdom left me a bit cold, so on sitting down to watch The Grand Budapest Hotel I really didn't know what to expect. The true answer is that I can't quite make up my mind. It's a stunningly visual film, fantastically realised, giving life and colour to the fictional country of Zubrowska. I really enjoy the photography in Anderson's films with lots of still shots framing the scenes, a kind of 2D quality, almost like a comic-book, that works really well for me and this film is no exception. The way the hotel is shot gives it a magnificent scale, 'grand' in every sense of the word. Ralph Fiennes is brilliant as the film's hero, Mr Gustav H, concierge of the Grand Budapest. He's completely charming, witty and often foul-mouthed, using his slippery charm to get him out of all sorts of trouble. He's accompanied by his lobby boy Zero (Tony Revolori) as they navigate their way through multiple perilous episodes, all plotted around the death of Madame D (Tilda Swinton) who has left a priceless masterpiece to Mr Gustav in her will, much to the ire of her villainous son Dmitri (Adrien Brody) and his henchman Jopling (Willem Defoe). Like most of Wes Anderson films it will take a few viewings for me to ultimately decide whether I like it or not. Until then, let me just say this. It's definitely worth going to watch, based on Ralph Fiennes hilarious performance alone. Whether the story is good enough to entice you into repeat viewings is another matter. To quote another fantastic fox, 'It's different...but it's not a hen '.